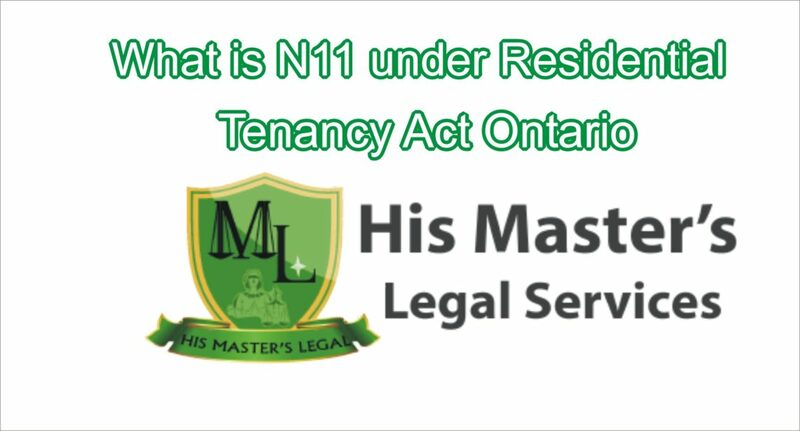 Upon reaching an agreement with the landlord or tenant, both, the tenant and the landlord must execute an N11 form. It is highly important to note that each party takes their time to review the document and sign it after having an independent legal counsel. The parties must be signing the document at their free will without any duress. It is highly recommended that each party is represented by an independent legal counsel and each party signs the document in the presence of their respective legal counsel. There are times, the tenant or the landlord could argue that they signed the documents under duress or without any independent legal counsel. The N11 Document does not have any space to state that the document is signed in the presence of their respective legal counsel. However; it is advisable to document the name and the license number of each legal counsel for future reference. The termination date must be clearly indicated on the N11 Form. His Master’s Legal Services Professional Corporation in Ontario is represented Landlords and Tenants in this matter and offered their Legal Services in Toronto and the surrounding.